In mid-October I updated my thinking on the Nikkei, asking in this post whether its break above quarter-century resistance meant it was finally “game-on” for the region’s much beleaguered equities after what seemed to be an enduring, generational secular bear market. Based on the analytics presented in that post, I answered the “game on?” question with a “resounding yes”. 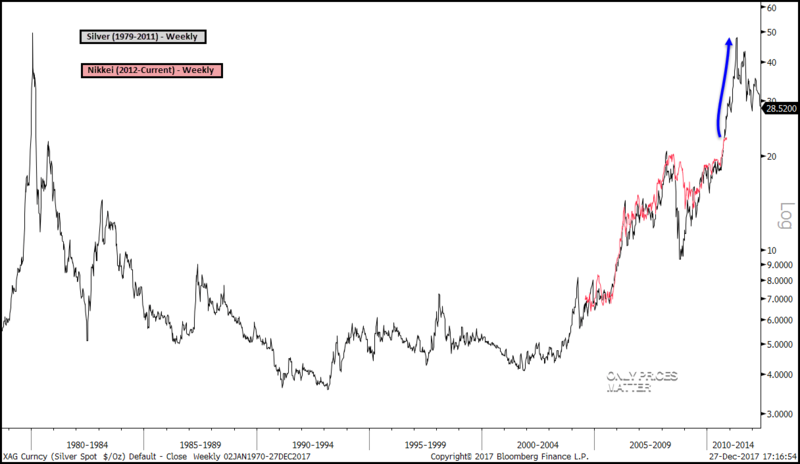 I derived this conclusion from the Nikkei’s highly analogous set-up over the 1989-current period, with a special focus on 2012-current, to silver over the 1980-2011 period, with a special focus here on 2005-2011. 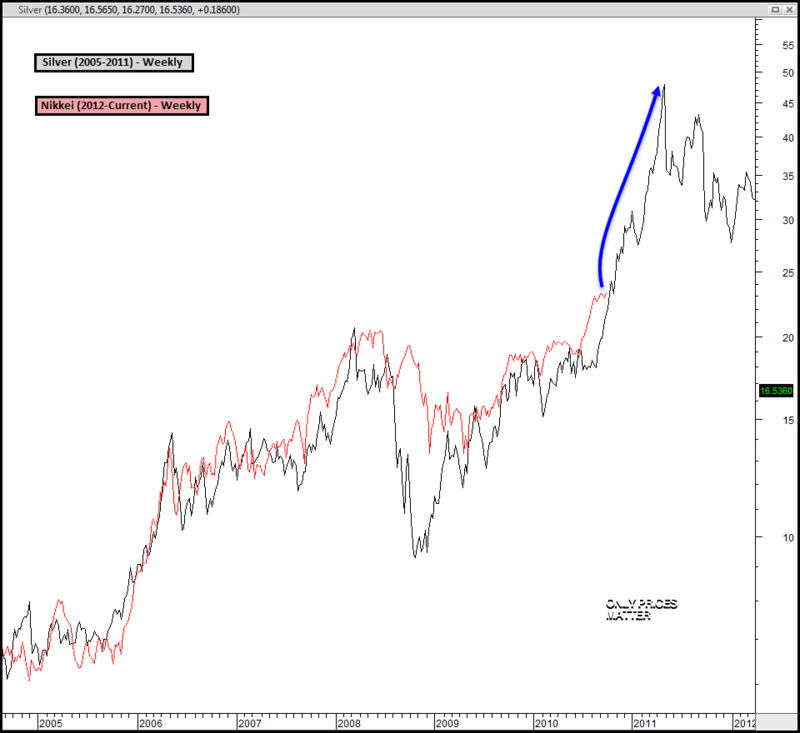 Though the original post did a good job of going through the similarities b/t the two cycles and why silver’s cycle was suggesting the Nikkei might begin a hard and fast move to 40K in the coming year, it stopped short of actually overlaying the Nikkei’s 2012-current path with silver from 2005-2011. While there were multiple comparisons, including a side-by-side with detailed annotations, there was no overlay. Given the similarities b/t the cycles, the absence of an overlay was conspicuous. Thus, overlays are presented below. Different chart services always provide a different look, so I’ve included comparisons from Bloomberg, Stockcharts and Metastock, the three items I tend to rely on most heavily. Long-term vs. short-term charts can also make the analysis look different, so I’ve included a few long-term versions so we can take a step back and see the bigger picture as well. So, what does one think about the comparison? I find the similarities ineluctable. In addition to their similarity in appearance, there are time-based similarities as well. I outlined in the original post the long-term similarities. However, I didn’t cover the short-term ones. 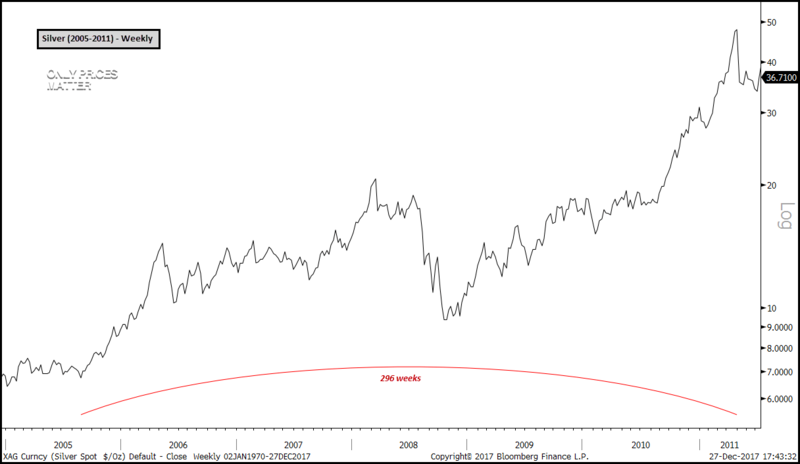 As it stands, it took silver 296 weeks from its final pivot lower in 2005 until it peaked at its all-time high of ~$50 in late Apr-11. As of now, the Nikkei is ~268 weeks past its final Nov-12 pivot lower. Should timing remain similar, we’d expect the Nikkei to be approaching or have reached ~40K by the week of 7/11/18, or +296 weeks off its last Nov-12 pivot. In parting, I’ll simply remind the reader of the big picture facing Japanese equities at the moment. 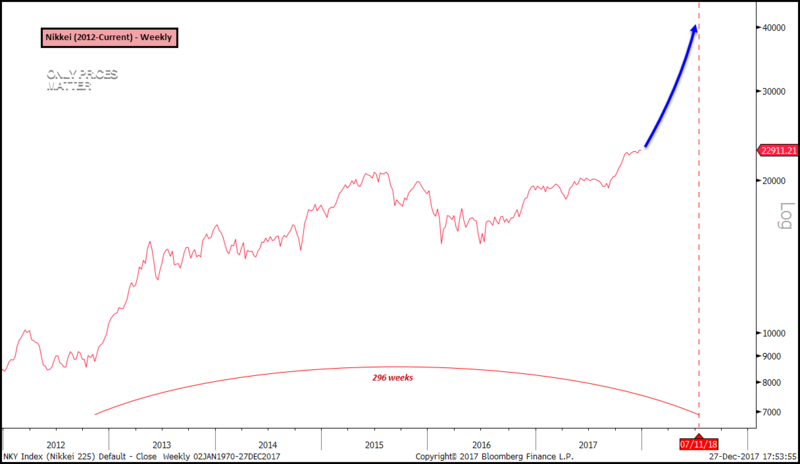 That’s the reality that the Nikkei cleared quarter-century resistance in late 2017 as it marched up to nearly 23K and that for the past month it has merely paused to digest that run by situating itself nicely atop the same resistance and slowly, but surely, consolidating its sprint from < 20K earlier in the year. With absolutely no resistance left on the chart and a historical parallel that looks identical to silver’s 2.7x run in late 2010 and early 2011, it’s very hard not to own and over-weight this index at the moment. The case for Nikkei 40K before 2018 is out remains bright for the time being. 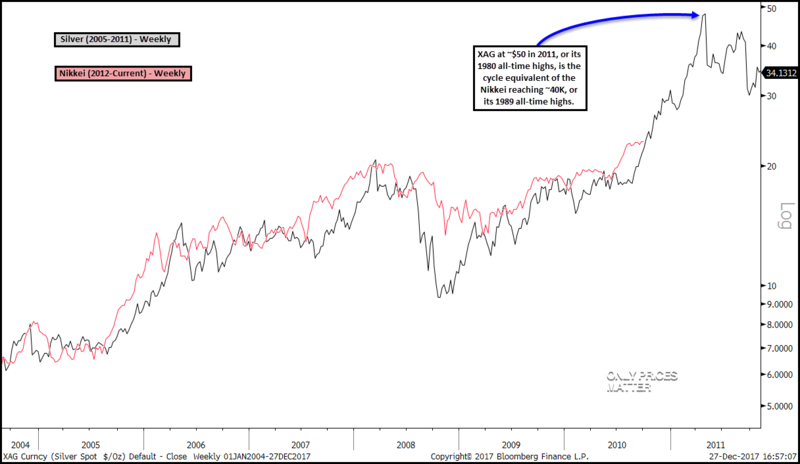 ← Mid-Cycle Pause Analog Update: First Signs of Euphoria?